Sally Ann Roberts accepts the Louisiana AP lifetime achievement award. The 2018 AP awards were held in Jackson, Mississippi. 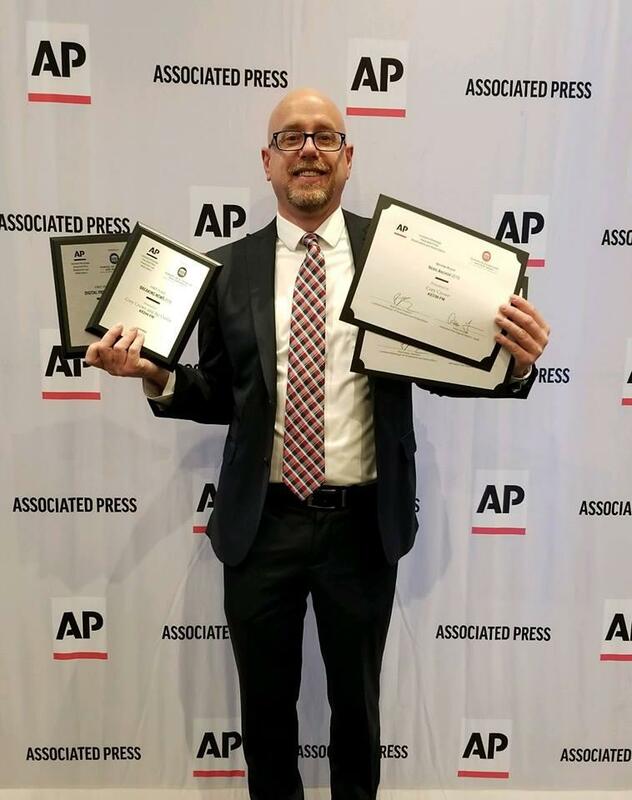 90.3 KEDM Public Radio won four awards Saturday night at the Louisiana-Mississippi Associated Press Broadcasters and Media Editors News Excellence Awards. The event was held at the Two Mississippi Museums in Jackson, Mississippi. The night featured the best of Radio, Television, Print and New Media. KEDM was the winner of "Best Digital Presence." This new award judges stations websites, social media feeds and apps. Participants were judged on digital presentation and innovation showcasing local content. KEDM News and Public Affairs Director Cory Crowe and General Manager Jay Curtis were winners in the "Breaking News" category for coverage of the April 2018 tornado outbreak that hit north Louisiana and south Arkansas. the second place award for live news work in the "Best News Anchor Louisiana - Mississippi" category. Kelby Ouchley, Josh Madden, and Ashish Dev were second place winners for the Bayou-Diversity series in "Podcast." There were 1,260 entries in the Louisiana-Mississippi contest. The evening was sponsored by The University of Mississippi School of Journalism and New Media. KEDM is a public service of The University of Louisiana at Monroe; broadcasting NPR News, classical music, jazz, and other entertainment from studios in Sandel Hall. The station relies on funding from listeners, local businesses, ULM, and the Corporation for Public Broadcasting.